Derrick Sanskrit was The A.V. Club’s man on the ground for last week’s New York Comic Con. In addition to playing some cool upcoming games that he’ll tell us all about on Friday, he put together a “best of The Gameological Questionnaire,” including questions from multiple incarnations of our reader-written survey and a few queries of his own. 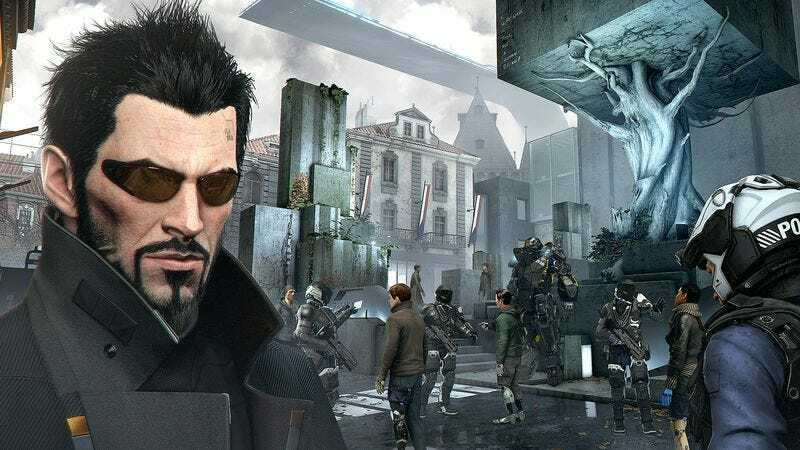 After the tremendous success of 2011’s Deus Ex: Human Revolution, fans are eager to get back to the cyberpunk adventures of Adam Jensen and his futuristic war against terror. The next game in the series, Mankind Divided, arrives early next year, and we pulled game designer Antoine Tisdale away from the busy New York Comic Con floor to shed some light on Jensen’s next outing. If an alien species discovered Deus Ex: Mankind Divided as the only remnant of human civilization, what would they learn about us? Antoine Tisdale: Are they good or bad aliens? The A.V. Club: Up to you. AT: If they were Vulcan-ish, so very good but then very annoyed with everyone who is technologically inferior, they’d probably think that we’re completely nuts, first and foremost, for choosing synthetic over organic, by augmenting ourselves with machines instead of finding more natural ways of upgrading ourselves like they would do. However, if we’re thinking more like the Imperials or something like that in Star Wars, they’d probably really like the idea of coming down here and finding all the sorts of ways they could control us and enslave us. If my résumé included a whole summer spent playing Deus Ex: Mankind Divided, how could I spin that into valuable work experience? AT: What kind of job are you applying to? AT: You’d certainly be very good at double-agent stuff, so you’d be very good at lying and understanding when people are telling the truth. You’d be able to read facial gestures and all these little things. You’re probably very good at sneaking around. Unfortunately, there’s a good chance you’d be good at killing people as well, which is morally kind of odd. AVC: Generally frowned upon in the office. AT: Well, it depends. You said any job! There are jobs that would gladly accept that as a skill. It’s a good way to move up the ladder as well. You know, take out the competition. You’d probably be rather good at accessing computers or convincing people to do things for you as well, like when you want to have photocopies made really fast. And you would potentially be a very well-dressed man. Sharp and very trendy. You’d probably find a better job at night than during the day. If copyright law were no concern, what character from another game, comic, movie, etc. would you like to see crossover into Deus Ex: Mankind Divided? AT: Personally? This is not the Square Enix answer, this is the Antoine answer: I have to say Big Boss or Revolver Ocelot, my favorite character. AVC: How do you think Jensen would get along with them? AT: You know, I think there’d be a big conflict of interest. That would be, like, a Tarantino-movie type of conversation. That would be priceless. Jensen is very motivated in finding the truth and revealing all the bad guys, while Big Boss is really about being free. They’re sort of going the same way, but they use very different methods. If Deus Ex: Mankind Divided were the main course of a meal, what would be the appetizer and what would be the dessert? AT: Human Revolution [the previous Deus Ex title] would have to be the appetizer—it’s the beginning of a thing, and it’s a lot already. If you’re still hungry—hopefully you are—Mankind would be the entrée. Then you’d be full. You know what would be great, just to cleanse the palate after all this? Lovers In a Dangerous Spacetime. I’m playing that right now and it’s so mind-blowing. I play like, “I’m tired of all this seriousness,” go play that game, boom, it’s a nice little dessert, all sweet. How would you describe Adam Jensen’s ideal first date? AT: A walk downtown, preferably when it’s raining so you can cuddle a bit, you know? You need to bring the date on a ride in a helicopter and sort of do the Superman thing, the sort of, “Oh my god, we’re going to fall!” and then save the day using Icarus Landing and then land into a perfect little picnic thing on a rooftop, and then probably snipe some people from the rooftop. AT: Lethal or non-lethal. We’ve got tranquilizers rifles, sniper rifles, silencers—it doesn’t need to be very loud. AVC: What an intimate bonding experience. AT: Yes. I’m about to get fired, aren’t I? [Looks at Square Enix PR team.] I’m going to get fired. Let’s say Deus Ex: Mankind Divided has been adapted into a Broadway musical. Describe the big show-stopping musical number. And then they start punching and throwing themselves while they’re singing, and they go through walls, because you can see all the layers. So they go through a wall, and then it changes, and then another one, and then there’s all the chorus and the soldiers do salutes and stuff, and that’d be frickin’ awesome! AVC: I can see all the stagehands holding the scenery and running past. AT: It would work! It would work and it would be super cool, too! Jensen going and walls are going and breaking and everything. It would be like a Mortal Kombat stage where they go through walls and up and down and stuff, that kind of staging would be frickin’ mind-blowing. AVC: Jensen on strings hanging in place while the world moves around him? AT: Have you seen the video if Predator was a musical? All the guards are singing, “If it bleeds, we can kill it. If it bleeds, we can…” That kind of thing. With all the Task Force 29 guys on one side and all the gold mask guys on the other side singing one way, singing the other way. They’re masks, so it could be anyone, even puppeteers. You’re starting me on something. This is, yeah, you can’t use that. [Motions at my notes.] We’re gonna license this, right? [Looks at Square Enix PR.] Come on!